Border: White cotton on hoist edge, white wool on the three sides, three whipped eyelets on hoist edge. Star: Five point white cotton 3½" wide, 6" apart. 13 Stars on flag. 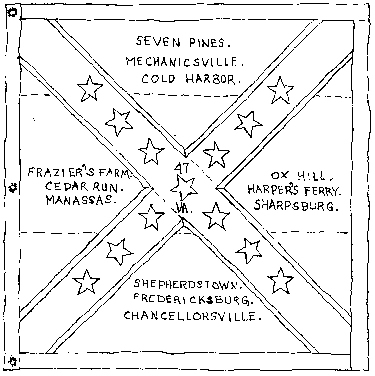 Flag of the 47th Virginia captured at Weldon Railroad, Globe Tavern, VA, 19 Aug 1864. Captured by Sgt Charles Brown, 50th Pennsylvania Infantry. Star: Five point white cotton 3½" wide, 6" apart. 10 remaining after capture. 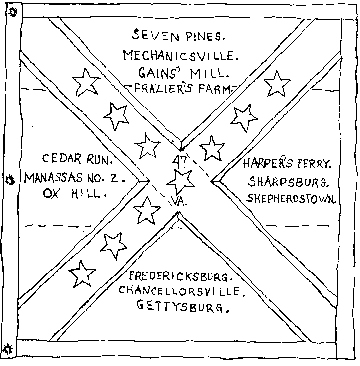 The following is an account of how the 2nd Flag of the 47th Virginia was captured at Weldon Railroad, as written by the captor, Sgt Brown of the 50th PVI. Thanks to Mr. Stu Richards for submitting this account. We received orders to charge on the balance of the rebels. As soon as we began to charge on them they took to their heels and retreated as fast as possible. We took a great number of prisoners. We are now at the breastworks and are charging right on. Now we have taken the breast works. There was not more than one out of every ten that escaped. While at the brestworks I heard a peculiar sound coming from the other side of the works. I crawled on top of the works and looking around saw Charles Oswald and Joe LOng fighting two rebels. They seemed to have the best of the rebels. Looking ahead about 50 yards I saw a rebel sgt. and two color guards working their way through the wood. I was then wearing a sword and had no gun, but I jumped down and picked up a Belgian rifle . I thought she was loaded and ran after the Sgt. and color guards When I got close to them and commanded that they surrender. One of the guards attempted to raise his gun and I said "drop that" and then made them turn around and marched back to the brestworks. I then threw down my rifle and took the flag from the sgt. and got to the top of the brestworks and waved it. Our whole regiment cheered me. But my waving drew the entire rebel fire at me. The soles of my shoes were shot off as also the rim of my hat. Many shots went through my clothing and it got to hot and I jumped down back of the brest works. In shooting at me the rebels killed Charles Burkett, Adam Burkett and William Wagner. After the firing was sum what lessened we examined the flag and found that it belonged to the 47th Virigina and it was presented by the Ladies of Richmond. It had the marks of many battles on it that were fought in Virginia. The sgt. and color guards sitting near by cried bitterly that the flag which they had prized so highly had been taken from them. I then stuck the staff in the ground and lay down beside it and went to sleep. General Wilcox came by and awakened me and said Brown while you were asleep I heard all about the capture of the flag and the Sgt. and color guard. Now the law of the government requires me to send this flag to Washington for safe keeping and it will be labeled by whom and how it was captured so that future generations can view it. He said he would see that I was properly rewarded.